GOOD NEWS – The Forest Inn has now re-opened for business – 23.10.1026. Today, probably the most famous thing about Hexworthy is that Pen Hadow, the first person to trek solo and unsupported from northern Canada to the geographic North Pole lives there. 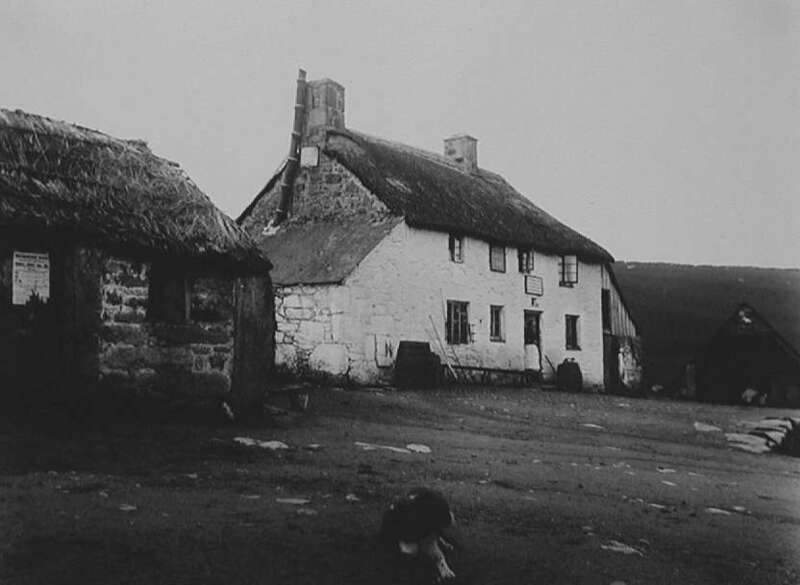 But a century or so ago a famous Dartmoor explorer often stayed at Hexworthy and in particular at the Forest Inn. William Crossing often mentions the place in many of his books and it is not hard to see his love for the place. “It is far and away the finest view within the forest of Dartmoor,” .Crossing, 1987, p.111. “From the Forest Inn at Hexworthy the beholder looks upon one of the finest scenes on Dartmoor,” Crossing 1990, p.456. “I know of no more interesting view in the whole of Dartmoor than is to be obtained from the door of the Forest Inn at Hexworthy… but for interest and beauty, and an exhibition of the mingling of wildness with the efforts of the cultivator, none can surpass it within the bounds of the moor,” Crossing 1974, p.59. The inn started life in the 1850’s as an angler’s ale house at which time Richard Cleave applied for a licence to sell ale and liquor, Hemery 1983, p.140. Originally the inn was to be called the ‘Forest Arms’ but the name was changed a few minutes before applying for the licence, Crossing, 1966, p.31. Presumably his clientele at this time would have consisted of the tin miners from the nearby Gobbet Plains. As can be seen below, the original building was thatched but a fire in 1913 soon put paid to that. Fortunately a small section to the right of the old building was left and this was then incorporated into the new refurbished, tiled inn which was re-opened in 1916, Quick,1992, p.46. In 1933 it was reported that the Forest Inn was constructing a tennis court, this at a time when many of the other Dartmoor hotels were providing modern amenities. During the time of Crossing’s patronage Richard Cleave was still the landlord who according to Mr. Crossing, “offers shelter and homely fare to the traveller,” a fact at time which Crossing took to the extreme. There are several occasions where Crossing relates how he had unexpectedly stumbled through the door late at night and received hot food. In one case not only did he arrive late but he then went down to fetch a nearby neighbour back for a late night ‘ramsammy’. Some of his ‘stays’ at the inn could be quite lengthy such as in 1878 when he resided at the inn for several months. He also relates,1966, p.30, how the need for a new sign prompted him to put his artistic skills to the test by actually painting one which was later hung outside. Crossing also mentions an old sheep dog called ‘Help’ who was the pub dog and it is interesting to note that in an early photograph of the inn there is indeed a sheep dog sprawled across the bottom of the picture – see here. One sad event took place at the Forest Inn in 1895 when Richard’s son Moses; “died from the effects of a wound in the throat, inflicted by himself on the previous Sunday. The rash act was committed by the deceased in his bedroom, he having gone to lay down for a rest. He was about 30 years of age, and had only been married a short time. It is stated the poor fellow met with an accident some time ago, and that he had suffered in his head ever since.” Exeter & Plymouth Gazette, Monday 5th of August, 1895. Whilst the inn was in the hands of Trust Houses Ltd they actually changed the name to the Forest Inn Chalet which supposedly gave it a grander image? In 1929 The Times newspaper published an article which stated that: “The Predecessor of the present Forest Inn at Hexworthy was said to have possessed a fire which for over 100 years had never been allowed to go out…” Which may well be so but there again there may have been some confusion with the Warren House Inn. Being in such a remote location the weather could cause a few problems. In 1924 Captain Guy Alexander the the licencee of the Forest Inn appeared before the Tavistock Brewster Sessions to answer a charge that he refused entry to the premises to a “respectable charabanc party who were travelling over the moor from Torquay.” It was also alledged that the landlord said how he did not care for charabanc visitors and promptly sent them on their way to Princetown. In his defence Captain Alexander noted how at the time of the charabanc visit the inn was full and he was unable to accommodate them. At the same sessions the landlord of the Lydford Inn also had to answer similar charges and it appears that such parties were none to welcome on the moor. During a heavy snowfall in the late January 1947 Hexworthy was completely cut off for about a week during which time the local residents were fast running out of food. Mr. C. C. Roberts of the Hexworthy Inn reported how he walked to Holne Chase to meet the butcher from Ashburton who had managed to get food supplies there, he then carried the load on his back the seven miles back to Hexworthy through the deep snow. Crossing mentions an early time when how one snowy he night he managed to struggle to the inn only to find that they had run out of ale. The following morning the landlord set out for fresh supplies in Ashburton. Having successfully reached the town and restocked he headed back for Hexworthy only to be beaten by the snow, he made it back but had to leave the beer along the way.On the 7th of January 1963 it was reported that a Landrover had finally managed to get through 15 ft snow drift to the snow-bound Forest Inn. There were still guests stranded who had originally booked in at the hotel for Christmas. In 1941 the inn once again hit the headlines when Charles Streeter was fined 10 shillings for a black-out offence. His excuse was that his son who was on home leave left a door open. In 1950 another incumbent of the Forest Inn, one Clarence Clegg Bliss was fined £5 for failing to pay National Insurance Contributions for one of his farm workers, he also had to cough up £33 12s and 2d for outstanding contributions along with £1 9s and 6d costs. In later years the Forest Inn was the venue for the Letterboxer’s bi-annual meet which took place the Sunday after clock change day. As the popularity of boxing grew it soon became clear that the inn could no longer cope with the numbers, especially where car parking was concerned so the ‘Meet’ was moved up the road to Princetown. In 1994 there was a sort of mini revival insomuch as a ‘Midsummer Muster’ was held there but this proved to be a one off. The forest Inn has always had connections with the hunting and fishing fraternities. Anglers have used the facilities for many years due to its proximity to excellent fishing waters. At one time it was possible to purchase rod licences from the bar, probably still is. It was about half a mile down the road from the inn (near Saddle Bridge) that Albert the Prince Consort was said to have caught his first Dartmoor trout. The inn has for many years been on the local meet calendar for the Spooner’s and West Dart Foxhounds and at one time was also a venue for the otter hounds. The surrounding valleys and moorlands provided excellent fox hunting country and not always in favour of the hounds. In a 1937 Times newspaper report of the Dartmoor’s November meet at the Forest Inn, it was noted that a fox in nearby Dunnabridge plantation was chased up a tall fir tree. A reckless hound then scrambled up after it and much to the relief of the fox, got stuck. Having seen the plight of its hunter the fox then scampered back down and made good its escape. Meanwhile the master and his whippers-in had to climb the tree and lower the hound back to earth on the end of a rope. During the early 1990’s I used to spend a lot of time at the Forest Inn and on one occasion I was shown an early visitor’s book which was full of hunting and fishing exploits. Salmon, trout, foxes, deer, otters and hares all graced the pages in one way or another. Obviously being so close to the moor the inn has always attracted many walkers, either as a residential base or for a pleasant watering hole after a ramble. In about the mid 1990’s the landlord converted some of the outbuildings into a walkers bunkhouse thus providing a cheaper form of accommodation. Since the advent of pony trekking the Forest Inn has also become a popular stop off for the riders as was once testified by the hitching post placed outside. The other little quirk about the place used to be the fun and games when people came into the bar and asked for a public phone. Regardless of the weather they would be directed to the phone box which stands on the roadside opposite. The monopoly on telecommunications lies very much with the landlord as the mobile network coverage is virtually nil at the inn. As can be seen from the above photo, if it was wet the poor souls would be in for a soaking, much to the amusement of the locals. Crossing, W. 1997 Folklore & Legends of Dartmoor, Forest Publishing, Liverton. Crossing, W. 1974 Amid Devonia’s Alps, David & Charles, Newton Abbot. Crossing, W. 1966 Crossing’s Dartmoor Worker, David & Charles, Newton Abbot. Quick, L. M. 1992, Dartmoor Inns, Devon Books, Exeter. The Forest Inn closed for business in 2014 and has been shut ever since then, however it has been reported that in the June of 2016 a sale had been agreed. According to the Stonesmith’s website offers were invited in excess of £250,000 which does sound a bargain. However the inn is in serious need of total renovation and refurbishment which I would imagine will cost a significant amount. In the October of 2016 the Forest Inn finally re-opened for business. Does anyone know what is going to happen to the Forest Inn? According to Stonesmith’s website as of the 21st of June 2016 a sale had been agreed, they were asking for offers in excess of £250,000 which sounds cheap but the whole place is in need of total renovation and refurbishment. So presumably sometime in the future it will re-open? According to companies house the Huccaby farm owners (Mudge) are listed with two other individuals as directors of the Forest Inn. WE WENT DOWN TO LOOK AT IT IN 2013 AND IT WAS ON THE MARKET FOR £75.000, NOW THATS CHEAP. But we decided it was not for us and moved to New Hampshire Usa in 2014. We stay at huccaby farm a few times every year I love this place and now the Forrest Inn has been opened its made our stays even better. It offers good food and even take away pizzas great if you want to chill by the tent and watch the river.